Here in Northern Florida, we have enjoyed the excellent leadership of new Section Manager Paul Eakin, KJ4G. Eakin has been in office for eighteen months, and in that short period of time he has been able to effectively address several ARES issues that have simmered throughout the section, including redistricting here in our area on the central east coast, with a re-staffing effort currently underway. Perhaps his finest achievement was due to his up close and personal approach with disenfranchised emcomm operators in the major Orlando metro area of Orange County, to bring that community back into the ARES fold. Eakin's style of shuttle diplomacy among area clubs, individual operators, and the major EOC staff was key to effecting the change. "He's a breath of fresh air," and "He cares about us," were two comments I received from Orange County hams. In an effort to revitalize ARES here in the new East Coast District, which now comprises Flagler and Volusia (Daytona Beach area) counties, Eakin has called a special meeting to be held this Saturday in Volusia. All amateurs in Flagler and Volusia Counties who are interested in ARES can attend. Several key Section officials will be on hand to support the effort. It is hoped that volunteers will step forward to apply for ARES leadership positions during this meeting. Because of the challenges posed by the major storms of last year, it became apparent that we needed a way to contact amateurs for deployment in a more expeditious manner. The Northern Florida Database was just created and put on line on June 20, 2009. It is a complete tool to keep records of training, deployments, contact information, availability time frames, special skills, equipment inventories, memberships in ARES and other emcomm groups, emergency contact information for those on deployment, and other information. All Florida State EOC ESF-2 requests for amateurs to be deployed will be coordinated through the data base. It is the official application platform for ARES registration. Eakin also works closely with Florida EOC officials in Tallahassee, including well-known veteran John Fleming, WD4FFX, a long time supporter of state Amateur Radio emcomms. Together, they sponsored a hugely successful conference recently at the Tallahassee facility. ARES expenses were covered by funds from the FEOC, and several key staffers made presentations. ARRL Southeastern Division Director Greg Sarratt, W4OZK, Vice Director Jeff Beals, WA4AW, and Assistant Director Blanche Sarratt, N4LUV, were also in attendance to support the conference. A new Northern Florida ARES Plan is being drafted and should be completed soon. As we watch the Atlantic off the coast of Africa spin up embryonic cells of weather potentially destined for the magnificent Florida peninsula, it is reassuring that the state has an ARES program that is seeing new vitality with not only vigorous new SM Paul Eakin, KJ4G, at the helm of Northern Florida, but also with the seasoned veterans like Southern Florida SM Sherri Brower, W4STB, and West Central Florida SM Gerald Turner, N4GD. Florida ARES is ready for whatever comes over the horizon. The ARRL Board of Directors held its Second Meeting of 2009 July 17-18 in Windsor, Connecticut, under the chairmanship of President Joel Harrison, W5ZN. A number of issues of concern to ARES and emcomm operators were considered. The Board established a national-level appointment of Emergency Liaison Station (ELS), as part of the ERILS Program (Emergency Radio Internet Linking System) to tie ARRL Headquarters to affected areas during disasters via Voice over Internet Protocol (VoIP) to HF or VHF /UHF linking. The Board authorized the President to appoint an ad hoc committee to prepare guidelines for use by the amateur community and others to identify inappropriate uses of Amateur Radio, while preserving our role of providing communications during times of disasters and for public service events. The Board asked the committee to present its findings to the Executive Committee within 30 days. Questions and comments on these or any ARRL policy issues can be sent to your ARRL Division Directors. Amateur Radio operators pride themselves on the ability to get the message through "when all else fails" during a disaster. Amateur Radio emergency communication plays an important role in helping disaster relief organizations communicate when land lines, cell phones, and other traditional modes of communication become overloaded or fail. EmComm East is an ARRL-sanctioned Amateur Radio emergency communications conference, where operators involved in emcomm can attend training sessions on technical topics, learn from served agencies, obtain VE testing for license upgrades, and interact with other emcomm operators from all over the area. EmComm East will be held on October 3, 2009, in Rochester, New York. The featured speaker this year will be ARRL Chief Operating Officer Harold Kramer, WJ1B. Sign up for e-mail announcements or subscribe to an RSS feed, and keep informed of new developments in this exciting opportunity. $30 pre-registration is required, breakfast and lunch included, and seating is limited. For more information or to register online, visit EmComm East, or send an e-mail. 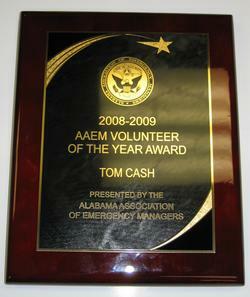 Tom Cash, KI4VFV, a Madison County ARES volunteer, recently won the Alabama Association of Emergency Managers (AAEM) 2009 Volunteer of the Year award. The Huntsville-Madison County Emergency Management Agency (EMA) is proud of their nominee for this annual, statewide competition. Cash serves Madison County in a variety of disaster preparedness and response organizations as an Amateur Radio operator, a Community Emergency Response Team (CERT) member, a stream monitor for flooding conditions, and a volunteer for the Be Ready Family program. Recognizing a need for an organized method of monitoring streams and reporting meaningful information back to EMA, Cash spent his own time and money to go to numerous potential flooding locations in Madison County and take pictures of the sites. He also developed a method of measurement for volunteers in the field and EMA to consistently report stream levels. WX4NHC, the Amateur Radio Station at the National Hurricane Center (NHC), is featured in a 60 second radio spot for Duracell batteries. The commercial, which begins airing this month, highlights the efforts of an all-volunteer army of ham radio operators for WX4NHC. Narrated by actor Jeff Bridges, it describes the important role that radio amateurs play during severe weather conditions -- enabling communications with emergency medical teams, police and fire departments -- when the power goes out. The narration underscores the importance of a reliable battery to power the portable ham radios, which are crucial to WX4NHC's work. Listen to the spot here. Iowa Governor Chet Culver wrote "It is with great pleasure we are writing to inform you that [Linn County ARES] has been selected for a 2009 Governor's Volunteer Award for outstanding contribution of volunteer service to your community. Your nomination was submitted by the Linn County Emergency Management Agency. The devotion of volunteers like you helps Iowa consistently remain in the top 10 states in the nation for its volunteerism rate. Thank you for contributing your time, dedication, and talent to make a tremendous difference in our state!" "This award belongs to all the amateur operators who stepped forward and served Linn County during the flood of 2008," said Scott Haney, N0GUD, EC Linn County ARES. "My hat is off to each and every one of you who has chosen to serve our community so well. I hope you will continue to do so in the future." 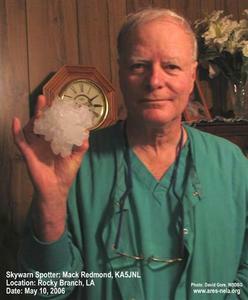 Louisiana SKYWARN Spotter Mack Redmond, KA5JNL, with large hail picked up in his backyard. When you live on a remote island with numerous mountains and valleys, communication can be tricky. Add interference that blocks the main communications frequency used by the local emergency rescue squad, and you've got a disaster waiting to happen. That's what responders and residents on St. John in the US Virgin Islands recently found themselves facing. On June 12, the primary repeater output frequency for St. John Rescue was completely blocked by a 2-tone AFSK signal; this continued for more than a week. Because St. John Rescue uses the frequency to dispatch, monitor and provide two-way communications during emergency calls, it was vital that the cause of the problem be detected and corrected - for public safety reasons. Luckily, some members of Rescue are also members of ARES; those individuals solicited additional help from the FCC and searched for the source of the interference. Working to resolve this serious problem were St. John ARES members Paul Jordan, NP2JF, Mal Preston, NP2L, and George Cline, KP2G - all members of the St. John Amateur Radio Club. Pinpointing the problem required looking at available clues: the sound the interference made and the fact that interference did not directly affect operation of a second Rescue repeater. St. John Rescue Chief Gilly Grimes and Paul Jordan, NP2JF, used hand-held Yagi antennas to "fox hunt" for the source of interference using triangulation. To their surprise, the signal was being received off the back of the antennas and coming in very strongly given that the source turned out to be 32 miles away from a tower on Mount St. Georges on St Croix. The carrier frequency was just 7.5 kHz above the Rescue frequency of 158.7525 MHz; upon closer inspection, the problem was isolated to a repeater that's part of the new US Virgin Islands territory-wide trunking system. This transmitter was licensed for and was putting out 120 watts with a pass band of 50 kHz, and was being tested as the control channel. I thought you brought out some very good key points on the qualities needed in an EC. I agree with most of what you said. I believe you should have further clarified your comment "The EC should be physically fit." Fitness is not an issue for me, but I do not believe everyone should have to be "physically fit" -- what do you mean by that? If someone has a disability, do you believe that impacts their ability to perform the function of EC? You also stressed allegiance to the chain of command: "A good EC respects the chain of command from the DEC, to the SEC and finally to the SM. A good EC may respectfully disagree with his senior officials, but gets behind their decisions and meets their requests, once they are made. A good EC understands the need for tolerance, understanding and acceptance of other points of view." I fully understand what you are saying here, but something is missing. ARES is a service organization and, as you have said, we have served agencies. In most organizations, there is a concern for internal customer service as well as external customer service. Truly successful organizations manage both well. I understand there are wide variations in the ARES organization. There are some that present ideal models, others a model of how not to do things. The principal problem is one of internal customer service. Perhaps the point I would make is clarified by an SEC statement made directly to me that ARES "is not a democracy." This SEC believed in running a volunteer organization like it was a military unit. There are a number of other incidents and issues over the years I could cite. Your comment that "critical is the character of the individual and his or her true understanding of what motivates people and how they can be led by example and good people skills" is the single most important aspect of volunteer management, but seems to me to be the most overlooked by your column. Leading by example is only one of the many skills a good leader will have. Most importantly, developing trust with the volunteer is paramount. When a volunteer knows "you have their back," they will move mountains for the team. You and I have a different view of the volunteer spirit, however: Volunteers cannot be managed like an employee, and that is the single most overlooked point in volunteer organizations. Many ECs fail to realize what motivates the volunteer, and until they do, their organizations tend to be cliquish and ones where the number of active volunteers is very low frequently because of the bad politics within the organization. The good EC will recommend assignments that play to the strengths of the organization rather than take assignments which don't. A good organization will, as you point out, keep the internal politics internal. Good ECs' organizations will be courted by served agencies. They will develop a reputation for excellence, and it's this reputation that will open stubborn EOC doors. It's not something that happens overnight, but rather something that is planned for the long term and exploited when appropriate. A good EC unites by evaluating his or her team and ensures the assignments fit the individual, and doesn't try to force the individual through a molding process. Every team needs people, even those who can't manage a net, those who have negative aspects of their personality (ones you wouldn't put with agencies), and those who just want a simple assignment. Knowing and respecting the capabilities of each and every member of your team is far and away the most important aspects of an EC's job. Respecting the volunteer's capability and self confidence is a tremendous leadership skill that is often overlooked. When you have a volunteer's trust, you are a leader. I lead by example, first to arrive and last to leave on events or activations I manage. I don't put dress code limitations on our volunteers, but I do notice those who present a professional appearance and give them assignments accordingly. I am the Emergency Coordinator for Garfield County, Oklahoma. I read your editorial and came away feeling somewhat disheartened. I have never considered myself the best EC in the state, but I try to make sure that our group is as prepared as possible for any communication emergencies that might arise. After reading your opening lines I started doubting my capabilities. I have done all I can to prepare myself and our group for activation and to make a professional appearance, but as I read your comments I began to feel like I wasn't qualified and maybe even doing our state ARES organization a disservice by holding the position. It dawned on me that I might not have what it takes to reach these high standards. The debate is always the same: "It's a contest!" argues half of all Field Day operators. "No, it's an emergency preparedness event," counters the other half. And so, back and forth it goes, year after year. I finally decided what Field Day is. Field Day clubs happily announce their procurement of a 50 foot communications van from their OEM, and reserve the sheltered pavilion on the ocean with rest rooms and BBQ grills. Their planning meetings start in January, a full six months ahead of the event. This is not realistic for an actual emergency. I live in south Florida, prone to disaster. When a communication crisis hits here, hams don't operate from pavilions, 50 foot air conditioned vans or even tents. Many end up in their own houses without commercial power nor outdoor antennas, which are blown down. If you want to practice your skills as a disaster communicator, then you need to participate in the annual SET (Simulated Emergency Test), a nationwide exercise in emergency communications, administered by Emergency Coordinators, District Emergency Coordinators, Section Emergency Coordinators and Net Managers. The SET weekend gives communicators the opportunity to focus on their emergency-communications capability while interacting with NTS nets. Back to Field Day: Planners consider who is going to bring the chili, what software should be used for logging and what call sign would bring the most prestige. Does this sound like planning for an emergency? No. So Field Day must be a contest, right? Wrong. Even the most serious contest and Field Day operators admit that they are just out there to have fun. The camaraderie generated by getting the club and their families together to socialize is the main objective. Competition is not a priority. So what is Field Day, really? Field Day is our annual public relations event. Your PIO should be the most important player. He/she should be inviting local and county officials like the Emergency Manager, Fire Chief, Police Chief, County Sheriff, hospital administrators, CERT leaders, and representatives from ARES/RACES groups. The media should be invited. So should the public. Prepare press kits, exhibits and hands-on projects for the kids in attendance. And be prepared to deal with the public as much as you do with your food menu. Have a Tour Guide on hand, and an Information Table, easy-to-understand handouts, and well-spoken representatives to discuss our contributions to the community. I was saddened to receive the following from Les Rayburn, N1LF, a frequent contributor and one of the finest SECs in the country: "It is with a heavy heart that I must announce my resignation as Section Emergency Coordinator for Alabama ARES. During my brief tenure, it's been my honor to work with some of the most dedicated Amateur Radio operators that I've ever known. I've also been grateful to get to know our County EMA Directors, State EMA personnel, dedicated first responders, and served agencies around the state." Best wishes, and good luck, Les! I received this kind condolence note from fellow Northern Florida ARES Net member John Reynolds, W4IJJ: "Sorry to hear about your loss. I just wanted to tell you that even though you might unplug your gear, the EMP from the strike will destroy your equipment. I have sustained several hits and found damage to equipment just laying on a shelf. On one occasion, the pulse was so strong, the induced currents melted the wire tie which was wrapped around a loaf of bread, exploded my G6 vertical, killed the front end of an IC28H which was laying on my work bench and blew a hole in a burner eye on the stove. That strike was 100 feet away to a pine tree! Good luck on getting your gear repaired."